The accelerated realities of a transnational era are challenging conventional notions of citizenship in ways yet to be determined. At the crux of any reassessment is the need to move beyond static, singular, and state-centric notions of citizenship that historically informed national models but can no longer abide by the multiple modalities of belonging and identity in a transnational world of globalization, the internationalization of universal human rights, surges in ethnonationalism, the intensification of diverse-diversities, and proliferation of diasporic communities. 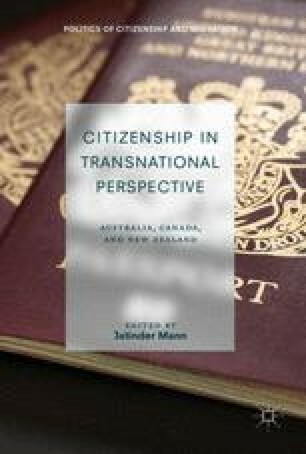 The chapter addresses the reframing of citizenship in the twenty-first century, what it means to be a citizen in a world of posts, trans, and isms, and what constitutes a meaningful citizenship from a transnational perspective across the settler domains of Canada, Aotearoa/New Zealand, and Australia. The term transnational is commonly used to describe how people’s lives transcend a single geographical space and national borders. But reference to transnational is subject to varying interpretations (Jonathan Fox, Unpacking Transnational Citizenship, Annual Review of Political Science 8 (2005), 171–201): a descriptive sense of what is, as a variable (a difference that makes a difference), an interpretive lens that offers new possibilities, and a lived-reality. At its narrowest, it can be defined as the process by which migrants forge and maintain ties that span or transcend national borders, in effect, creating new social spaces that are multilocal in defining who belongs, how they belong, and what belonging entitles (Sandercock, Planning; Conference Notes, Rethinking the Transnational Perspective: Shortcomings and New Approaches. International Workshop, University of Fribourg, 13–14 September 2012.) In this chapter, however, I am using the prefix trans in transnational in the broadest way possible, including references to trans as across national borders (dual citizenship); beyond the nation-state (cosmopolitanism and universal human rights); transcending state boundaries (diaspora + transmigrants + cosmopolitanism); transversing national space (multiversal citizenship); transpositional (Indigenous citizenship); and transforming (disruptive change). Collectively, a trans perspective secures a new discursive framework for rethinking the politics of citizenship in a world of posts, trans, and isms.